by Wilcox, Dennis L.; Cameron, Glen T.; Reber, Bryan H.
Dennis L. Wilcox, Ph.D., is professor emeritus of public relations and past director of the School of Journalism & Mass Communications at San Jose State University, California. He is a Fellow and accredited (APR) member of the Public Relations Society of America, former chair of the PRSA Educator’s Academy, and past chair of the public relations division of AEJMC. Among his six books, Dr. Wilcox is the lead author of P ublic Relations: Strategies and Tactics and T hink: Public Relation, and. P ublic Relations Writing and Media Techniques. His honors include PRSA’s “Outstanding Educator,” the Xifra Award from the University of Girona (Spain), and an honorary doctorate from the University of Bucharest. He is currently a member of the International Public Relations Association (IPRA) and the Arthur W. Page Society, a group of senior communication executives. Dr. Wilcox regularly gives presentations to students and professionals in such diverse nations as Thailand, India, Latvia, Serbia, and Argentina. Glen T. Cameron, Ph.D., is Gregory Chair in Journalism Research and founder of the Health Communication Research Center at the University of Missouri. Dr. Cameron has authored more than 300 articles, chapters, and award-winning conference papers on public relations topics. In addition to being coauthor of P ublic Relations: Strategies and Tactics, he is also coauthor of T hink: Public Relations and Public Relations Today: Managing Competition and Conflict. A popular lecturer internationally, Dr. Cameron has received the Baskett-Moss and Pathfinderawards for career achievement. Dr. Cameron gains ongoing public relations experience by managing over $42 million in external funding of health public relations projects for sources such as NIH, NCI, Missouri Foundation for Health, USDA, CDC, the U.S. Department of Defense, and Monsanto. Bryan H. Reber, Ph.D., is professor of public relations at the University of Georgia’s Grady College of Journalism and Mass Communication. He teaches introduction to public relations, management, writing, and campaigns. On the graduate level he teaches management, persuasion, campaign research, and public opinion. His research focuses on public relations theory, practice, pedagogy and health communication and has been published articles in such publications as the Journal of Public Relations Research, Journalism and Mass Communication Quarterly, and Public Relations Review, Dr. Reber regularly presents his research at national and international academic conferences. He is the co-author of several books, including Think: Public Relations, Public Relations Writing & Media Tactics, and Public Relations Today: Managing Competition and Conflict. Dr. Reber worked for 15 years in public relations at Bethel College, Kansas. He has conducted research for the Sierra Club, Ketchum, and the Georgia Hospital Association, among others. Chapter 1. 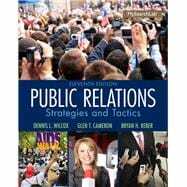 What Is Public Relations?